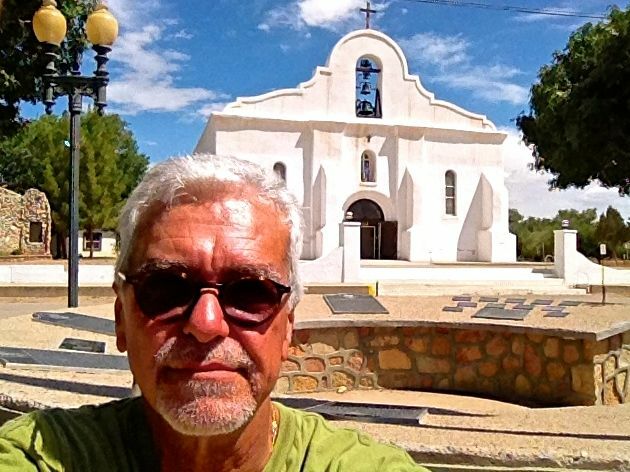 September 16, 2014 - When you get to San Elizario, Texas, in a part of the country that bears little resemblance to Plymouth, Massachusetts, you learn that you are in "a proud and picturesque community, which is gaining fame as the home of the 'First Thanksgiving.'" At least that's what the welcoming signs tell you: "The expedition of Spanish explorer Don Juan de Oñate held a Thanksgiving feast in 1598 near what is now San Elizario, twenty-three years before the Thanksgiving at Plymouth Colony." If you Google "first Thanksgiving," you are likely to get many more references to the 1621 feast of the Pilgrims than to the 1598 Spanish Thanksgiving. But that's only because most historians still start counting American history with the landing of the Mayflower. 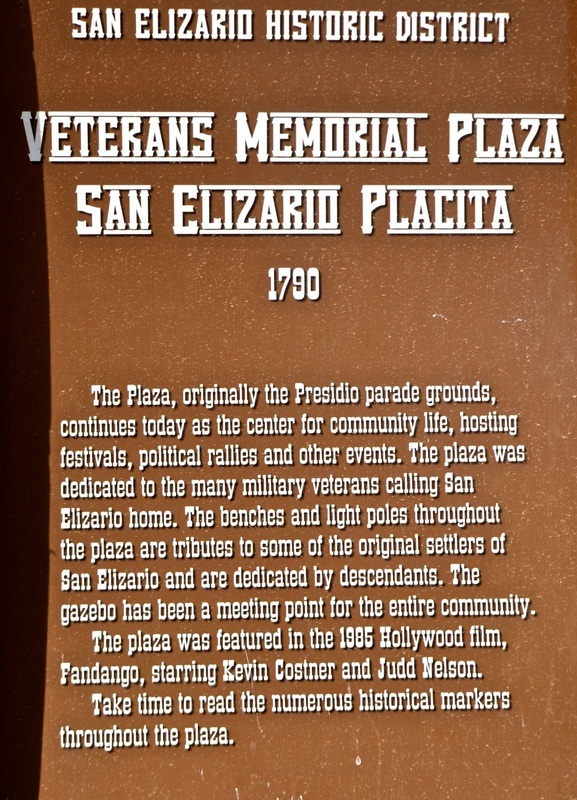 Yet a plaque in San Elizario's main plaza notes that the Oñate expedition celebrated "the first Thanksgiving in what is now the United States of America" on April 30, 1598," and that Oñate shaped the growth and development of the great Southwest for generations with "historic events (that) preceded the English colonies on the Atlantic seaboard, the French colonization of Canada, and the Dutch settlements in the Hudson River area by several years." But while exposing a huge part of our hidden Hispanic heritage, the plaque hides another part. It totally ignores the Spanish exploration of the Atlantic and Gulf of Mexico shorelines in the early 1500s and the Spanish settlements in Pensacola in 1559 and St. Augustine in 1565. 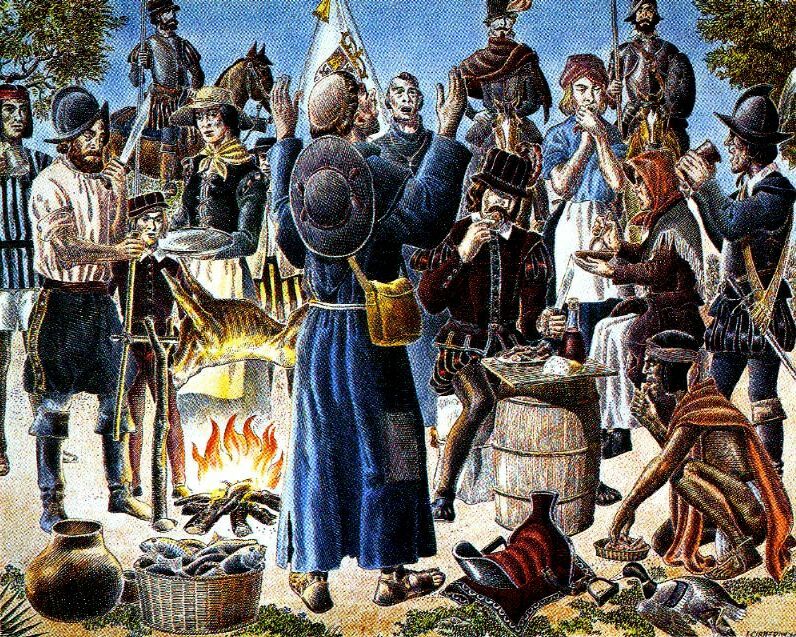 Indeed, the Texas Thanksgiving precedes Massachusetts' by 23 years, but it came 33 years after the thanksgiving Mass and feast celebrated by Pedro Menendez de Aviles and the Timucua natives in St. Augustine on Sept. 8, 1565 — 56 years before the Pilgrims. Florida historians speculate they ate salted pork, garbanzo beans and biscuits, and there are several artistic renditions of that feast, including a mural on the wall inside the Cathedral Basilica of St. Augustine, the oldest church in the country. Yet the story of the Texas Thanksgiving is indeed very valuable because it marks the beginning of a fascinating and often ignored part of American history. 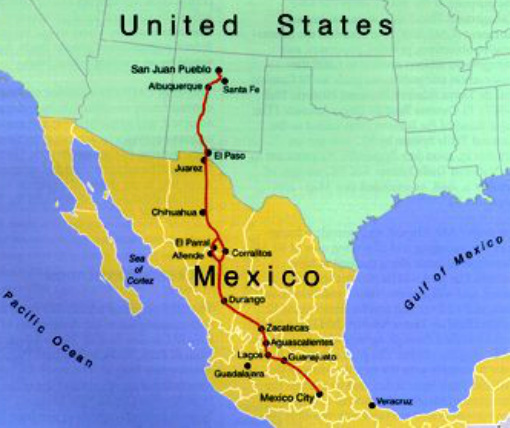 At San Elizario, you learn the Oñate expedition left Santa Barbara, in present-day Mexico, in November 1597, headed for what is now New Mexico. "Four hundred men led the way, 130 of whom had wives and children," the plaque explains. "There were several priests, 83 wagons and carts, plus 7,000 head of stock, they were planning to stay." 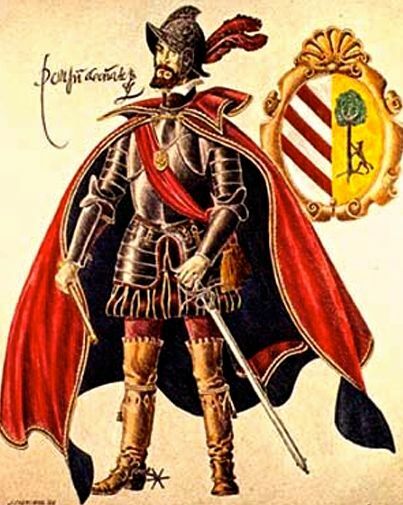 After trekking north across the barren Chihuahua desert for months, including the last four days without water, the expedition finally reached el Rio del Norte (now the Rio Grande), near present-day San Elizario, on April 26, 1598. 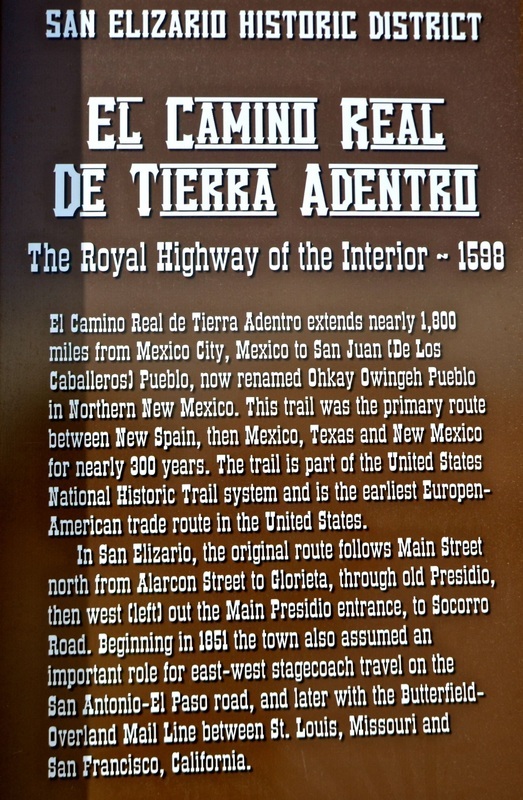 "Grateful for the completion of a perilous part of their journey, the abundance of water, and plenty of wild game along the river, the expedition set about preparations for a great celebration," the San Elizario plaque explains. Although some of their horses died from drinking too much water, the poet-chronicler of the expedition, Gaspar Perez de Villagra, described it as a "happy and joyous occasion." No doubt, they had plenty of cause for giving thanks. But saying they were the "first" Europeans to give thanks on American soil is a bit disingenuous. 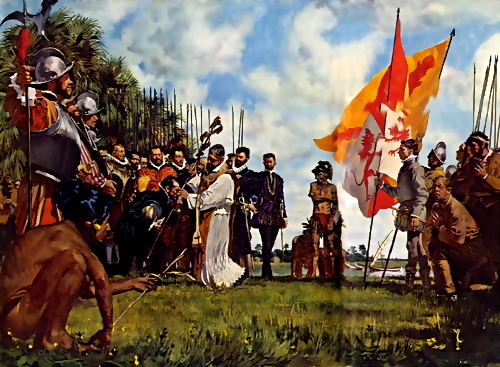 After all, the Spanish explorers held religious thanksgiving ceremonies every time they stepped ashore or explored new territory on what is now the United States — starting with the Juan Ponce de Leon expedition from Puerto Rico to Florida in 1513. 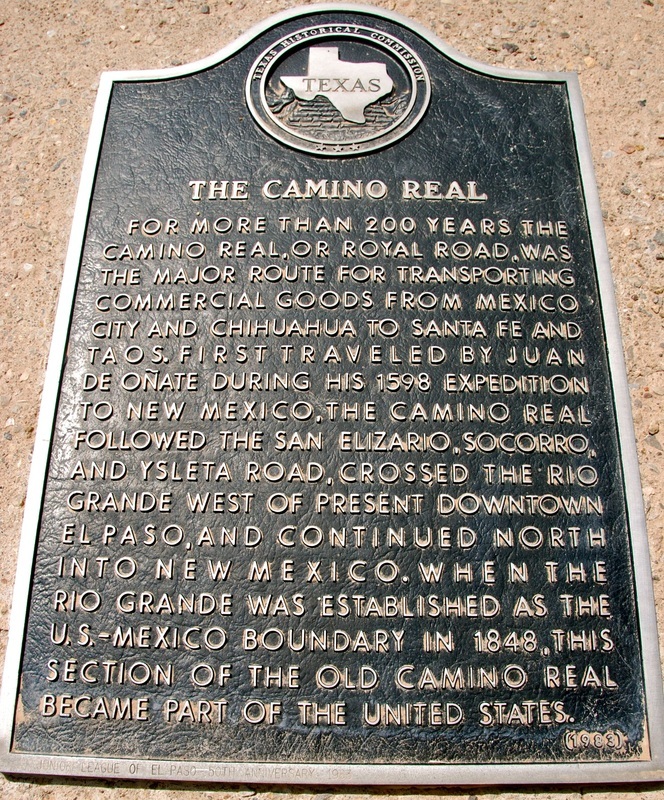 Indeed, even before the Oñate expedition established "El Camino Real de Tierra Adentro," the Royal Road of the Interior, which still leads to northern New Mexico, two other Spanish expeditions, in 1581 and 1582, already had followed the same path across the river through El Paso del Norte, the Pass to the North. And guided by Franciscan priests, surely they, too, gave thanks for having survived their treacherous journeys. But surely, they, too, came after Menendez had established St. Augustine. According to another plaque in San Elizario's main plaza, the trail that leads through this town and on to El Paso and northern New Mexico was really first traveled by Fray Agustin Rodriguez, who led two other Franciscan priests, nine soldiers and 15 Indians and "spent the remainder of 1581 exploring the vast region from present western New Mexico to the Texas panhandle." However, when natives killed one of the priests and the soldiers returned to Mexico to report it to Spanish authorities, Rodriguez and another priest stayed behind. 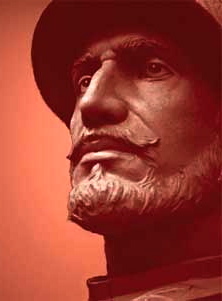 In 1582, Fray Bernardino Beltran led another expedition to find the missionaries, only to find that they also had been killed by natives. 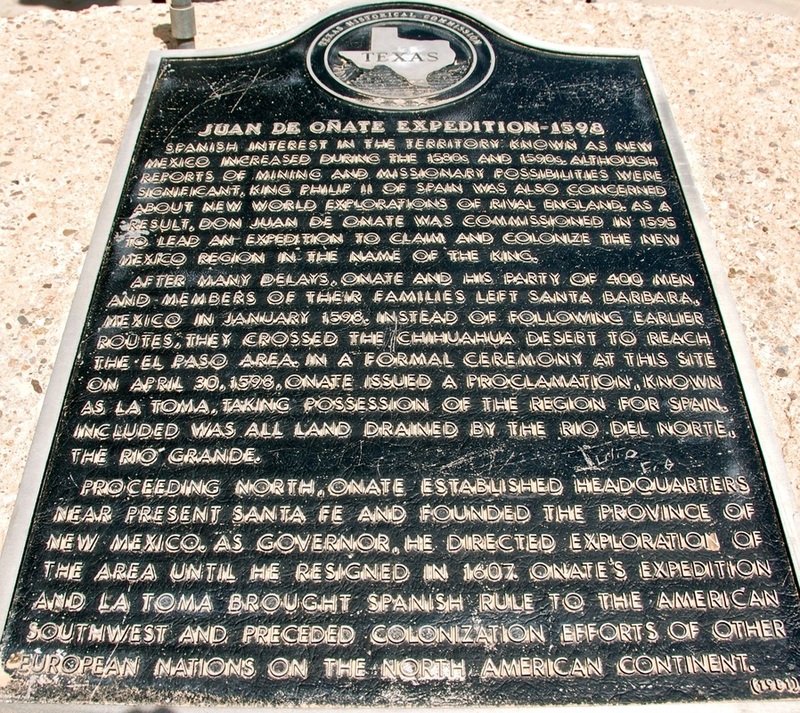 Nevertheless, one of the many commemorative plaques in San Elizario notes that these expeditions "marked the beginning of the Spanish influence in the area. 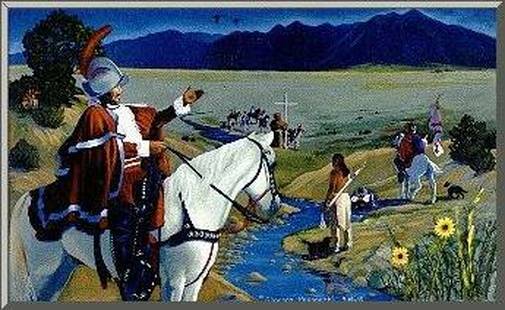 Their exploration opened the region, now the American Southwest, to later colonization." And along the way, they had many reasons and opportunities to be thankful. Yet amazingly, on the Internet, you find people still trying to rationalize calling Plymouth Rock the "first Thanksgiving" by arguing that it was the first holiday celebration instead of the first religious service. Yet even under that contrived definition, St. Augustine came first. The renowned Florida history professor Michael Gannon described it as the "first community act of Thanksgiving in a permanently established European settlement." You can't argue with that! But frankly, I welcome the debate over which Thanksgiving came first, not because I want to diminish the one we cherish and traditionally commemorate every November but because our pre-Mayflower Thanksgivings help us expose our hidden Hispanic heritage and the pre-British history of the United States. 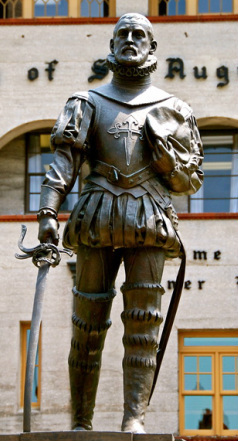 Next week, my Great Hispanic American History tour follows Oñate's path to El Paso, Texas, where the man called "the great colonizer" doesn't even have his name on a huge statue the city built for him. You'll find no bigger example of hidden Hispanic heritage!